Performance and grip not far off a 2014 M3, but with much better economy and much lower CO2. ALPINA insists on steering wheel button gearchanges that take a bit of getting used to, and the transmission is 8-speed automatic, not M-DCT. Launched at the Frankfurt Motor Show in September 2013, New BMW ALPINA D3 Bi-Turbo combines astonishing performance (173 mph, 0-62 in 4.6 seconds) with finely-honed bespoke engineering, 53 mpg and CO2 emissions of just 139 g/km. Based on BMW’s F30 3-Series, the D3 Bi-Turbo is the result of a two year development programme during which every aspect of the vehicle was analysed and refined to increase performance, comfort and style. Using design and validation processes identical to those implemented by BMW, ALPINA’s team of 70 development engineers worked with specialist suppliers to enhance the engine, gearbox, cooling system, body structure, wheels, tyres, aerodynamics, suspension and interior. With 350 PS and 700 Nm of torque, the D3 Bi-Turbo will catapult its occupants from zero to 62 mph in just 4.6 seconds and on to 173 mph, yet has combined cycle fuel economy of 53.2 mpg and CO2 emissions of just 139 g/km. 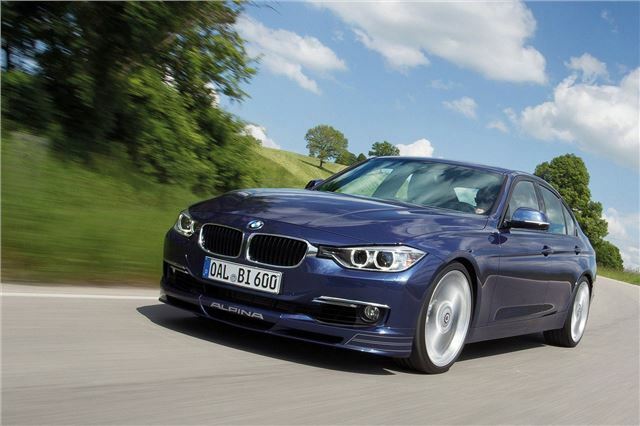 BMW ALPINA D3 Bi-Turbo Touring and D3 Bi-Turbo Touring with xDrive also available.